What I also really appreciate is she is bringing back the “f word” – feminists. Too many women have internalized the loud and obnoxious sexism of radio hate jockeys like Rush Limbaugh who make their living out of trying to hold on to the status quo. We should not allow bullies to make us afraid of standing up for ourselves and each other. After all, it has been repeatedly shown that when the lives of women improve, the lives of their families and communities also improve. I think there is much in the book that Asian American men, as well as women, can learn from in their own battles against the glass ceiling as well as for the women in their lives. Leadership has many styles and takes many forms, and right now, only one generally gets rewarded with promotion. 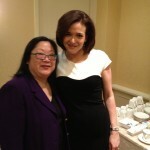 Sandberg isn’t just speaking out but she has joined with other women to launch www.leanin.org, a new website for on-line leadership learning, inspiration and fellowship. I hope you will read the book, check out the website and join the movement. Sheryl has challenged all of us — what if we all leaned in?